This time of year when everything seems to be dull, dreary, or dead, I feel like it’s my duty in the kitchen to add some freshness and pizazz to my cooking; it’s the least I can do! 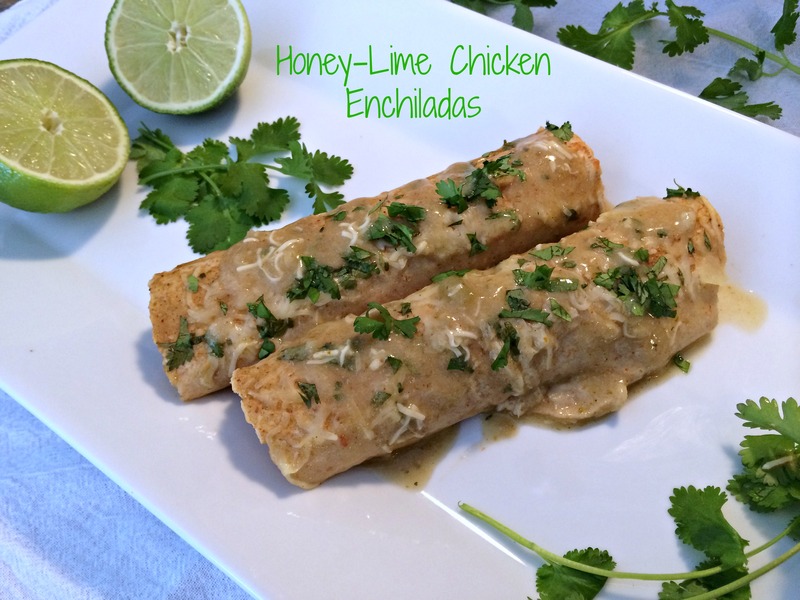 That’s exactly what I did with my Honey-Lime Chicken Enchiladas. 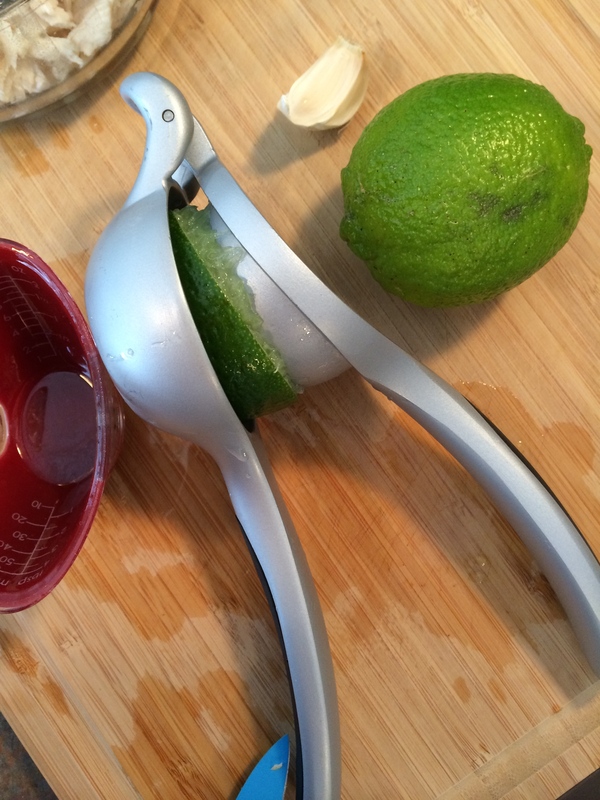 It’s amazing what a little freshly squeezed lime juice, fresh garlic, and cilantro can do for a recipe! I got this recipe from a great friend of mine, but I decided to lighten it up a little bit and also add a few more things of my own to it. I seriously think the best addition I made was the cilantro. The freshness of it really stood out from the rest of the “heavier” ingredients. 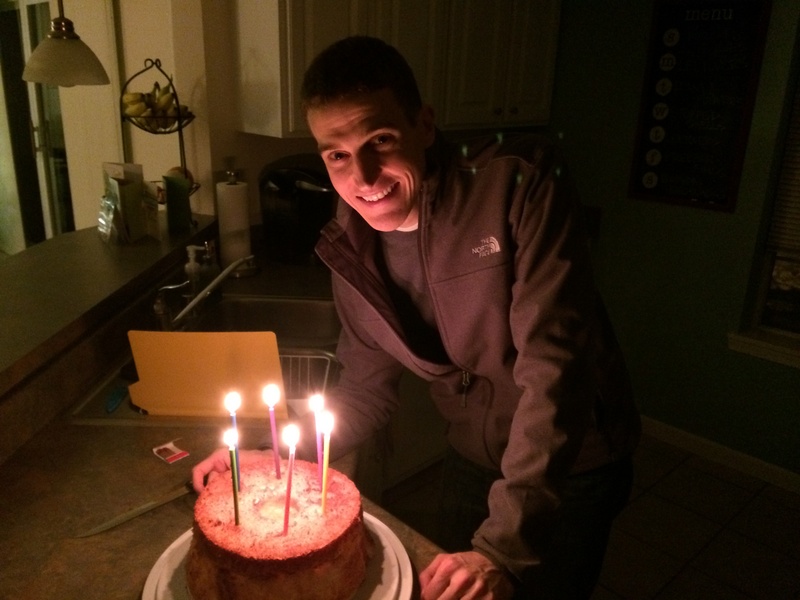 This recipe was actually for Philip’s birthday. There’s a good chance that if the food has cinnamon, lime, or garlic in it, Philip’s going to like it. So, when I was searching for a good, special meal for him and came across this one, I knew it was a match. 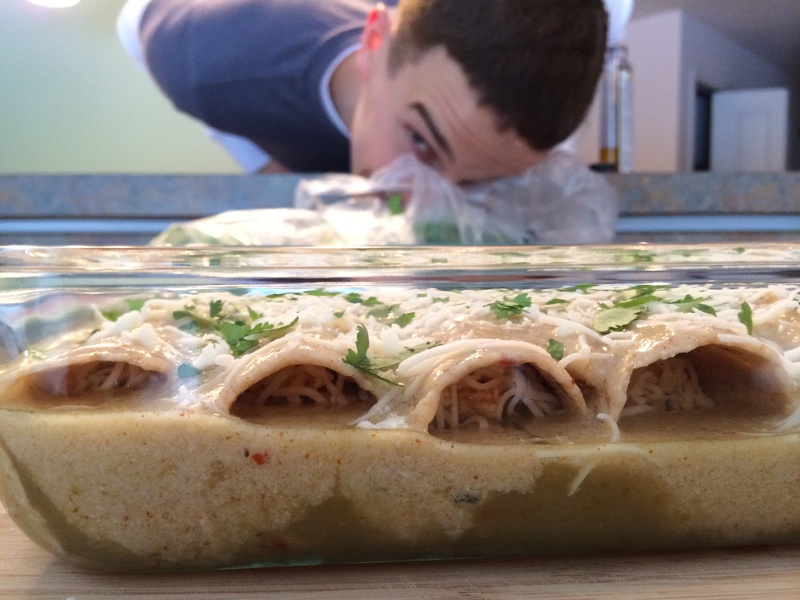 How could I possibly go wrong with Honey-Lime Chicken Enchiladas that had not just one, but two of his favorite ingredients?! Birthday dinner: Found. It turns out he loved his birthday meal, as did I. The best part? Well, there’s two. 1) I lightened it up by swapping out cream for just plain milk and reducing the amount of cheese, 2) It was so easy to make! 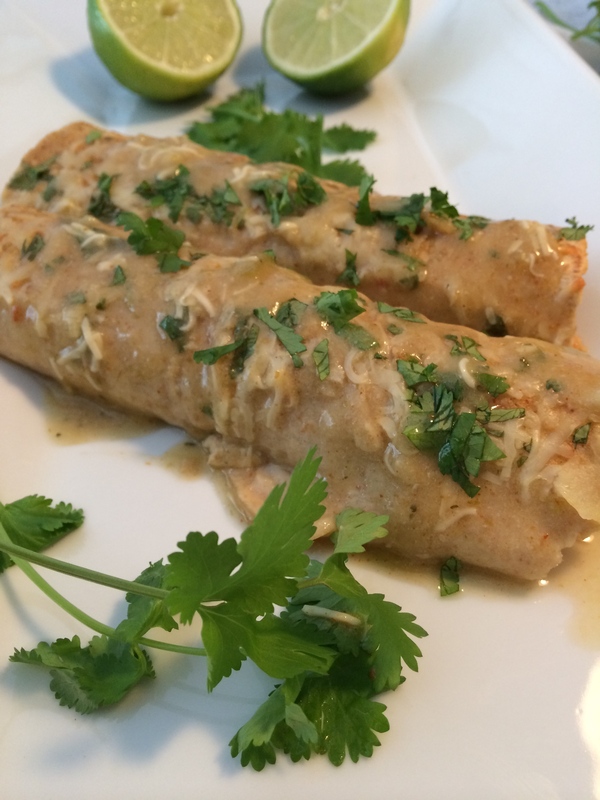 If you don’t have a go-to enchilada recipe or are looking for a new twist on a classic, this is it! These enchiladas were full of flavor and each bite seemed to burst with new and different flavors, but uniquely complimenting the previous flavors at the same time—first it was the sweetness of the honey, then you get a kick with the chili powder and enchilada sauce, and lastly to counteract the cheesy, creamy goodness of it all, the finale comes with the fresh lime and cilantro winning over your taste buds. Seriously, I’ve never had an enchilada with such a diverse array of flavors! I halved the recipe when I made this, but I honestly wish I would have made the whole, dang thing—it was that good! But, it’s nice to know that if you’re just one person or you’re not wanting a lot of leftovers, halving this recipe totally works. Start out by making the sauce for the shredded chicken (I just poached my chicken for about 10 minutes in boiling water, let it cool, and then it easily ripped off into shreds) with honey, lime juice, chili powder, garlic powder, and one of the minced garlic cloves. Reserve about six tablespoons of this for the enchilada sauce. Speaking of enchilada sauce, pour about half of the green enchilada sauce over the bottom of a 9×13 baking dish, or just enough to cover. With the remaining enchilada sauce, mix the other minced garlic clove, milk, and the remaining honey-lime mixture together. Pour about half a cup of this mixture over the chicken and mix together. Now on to the fun part of assembling the enchiladas! There are so many tortillas out there these days, it can be confusing! As a rule, I look for whole wheat tortillas and for this recipe, the smaller the better. There are enough other ingredients being added to this dish that having much larger tortillas is too much. Also, they don’t fit in the pan as well if the tortillas are much bigger than 5–6 inches. Not to mention, the smaller tortilla size helps with portion control. Who’s going to eat half of an enchilada? Even if the tortilla is a 10 inch tortilla, your eyes see a single enchilada and feels the need to eat it all. 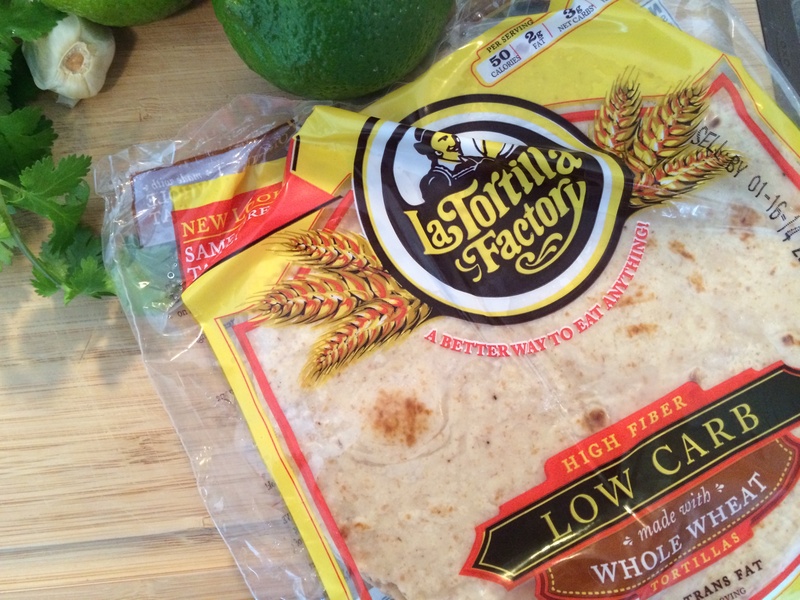 I also chose a low carb, high fiber tortilla in order to get more fiber (we need to try to get in about 25–27 grams per day!) and to cut back on the calories since the dish is already pretty rich. Ahem, okay, enough of my “dietitian talk”. Back to making enchiladas! Sprinkle the base of each tortilla with about 2 Tbsp shredded Monterey Jack cheese. The recipe originally called for more, but I really thought this was enough to taste the cheese flavor, but not go over the top. Too much cheese, and I feel it would have over powered the other really good flavors. Next layer on the chicken (evenly portion out the chicken to fill all 10 tortillas). 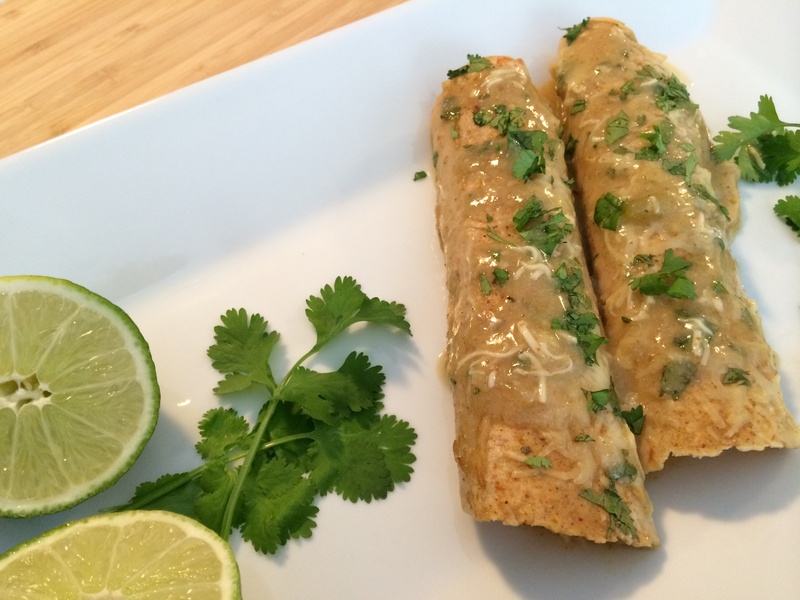 Lastly, sprinkle on some chopped cilantro, roll up, and place seam side down in the pan of enchilada sauce. Once the tortillas are all in the pan, top it one last time with the remaining enchilada sauce mixture, a light sprinkle of cheese (key word here is light; a little goes a long way), and some more cilantro. Once it’s baked, it will practically have you feeling like you’re south of the border and enjoying warmer weather with all the freshness you’ll be tasting. If only it was like that when I stepped outside…sigh. What are your favorite ingredients or flavors to add to recipes? 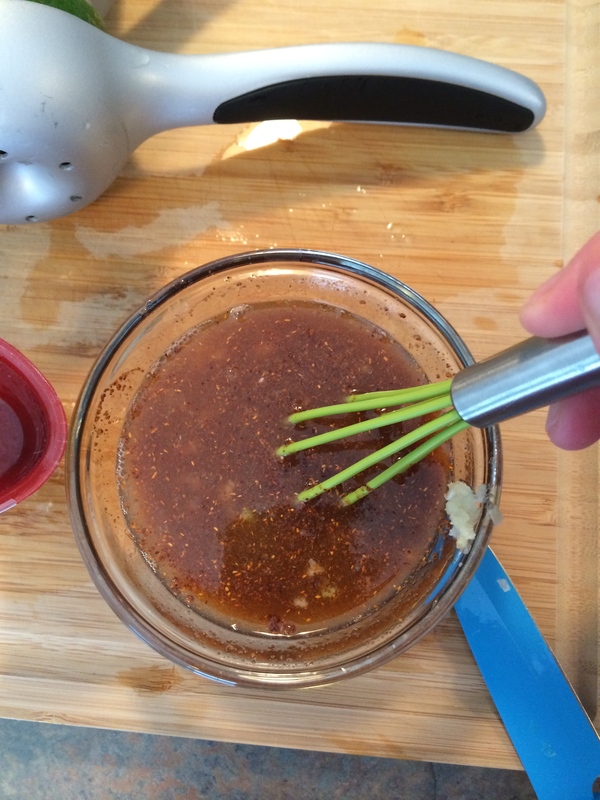 Whisk the honey, lime juice, chili powder, garlic, and one of the minced garlic cloves together. Reserve 6 Tbsp for the enchilada sauce. Toss the remaining with the shredded chicken and let sit for at least 1/2 hour. This sauce can be made ahead of time. Pour enchilada sauce (about half of the can) on the bottom of a 9×13 baking pan or enough to cover. Mix the remaining green enchilada sauce, the remaining minced garlic clove, milk, and the remaining lime mixture prepared in step 1 together until it is a light whip cream consistency. Pour a 1/2 cup of the enchilada sauce mixture over the chicken mixture and set the remaining sauce aside. To assemble the enchiladas, sprinkle the base of each tortilla with the shredded cheese (about 2 Tbsp). 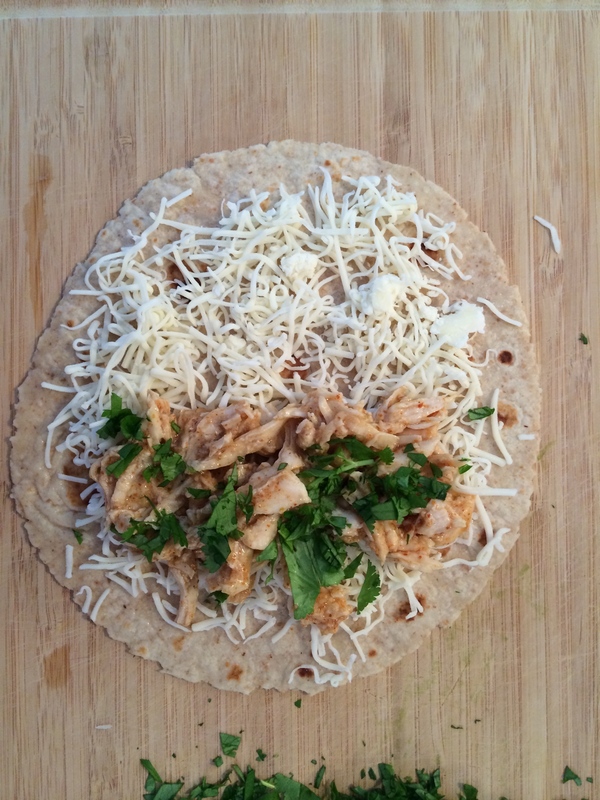 Fill the tortillas with chicken and sprinkle chopped cilantro on top. 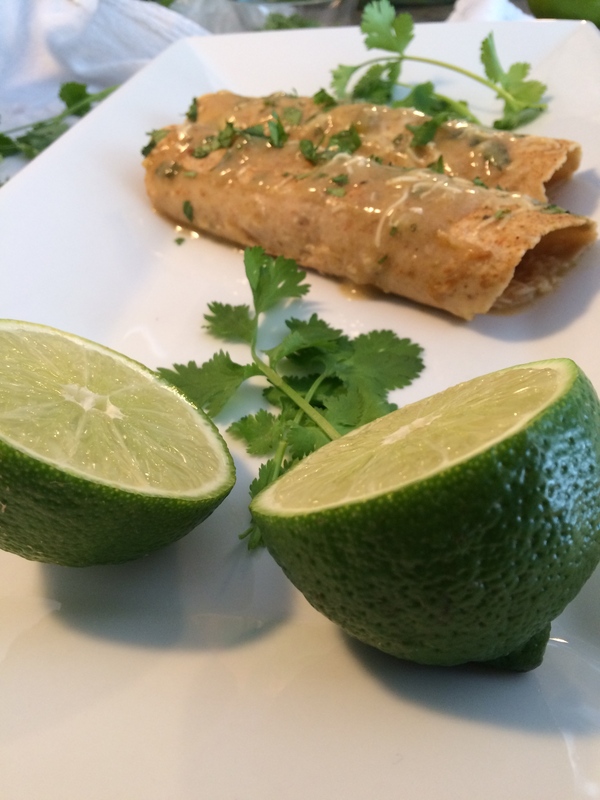 Put rolled tortillas in 9×13 pan as you go, with the seam on the bottom of the pan. Pour the remainder of the enchilada sauce on top of the enchiladas. Sprinkle lightly with remaining cheese and cilantro. Bake at 350° for 30 minutes until brown and crispy on top. Garnish on top with more cilantro and lime juice, if desired. YESSSSSSSSSSSS!!!!! My favorite dish yet! I need to try your lighten up version! Good solid choice! :)) I knew you’d like this post! I’m so glad you shared it with me. I need to make it again already, I think. Your posts always look so yummy! I’m going to have to try this one soon! Todd and I loved these! Delish! Thanks for sharing!